If the President is POTUS (president of the United States) and the First Lady is FLOTUS, then the first grandmother is obviously GOTUS. And, in the current administration, she has played a critical role. 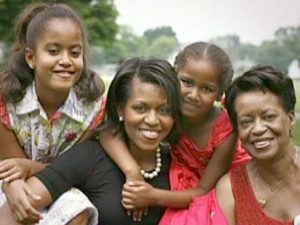 Although Marian Robinson, Michelle’s mother, moved into the White House “kicking and screaming,” according to her her son, and only agreed to do it as part of the transition to Washington, she has stayed for the entire two terms. She has kept a low profile, but her presence has helped her daughter maintain a higher one. And she has contributed to the stability and “normalcy” of the family in an extremely abnormal environment. Remember how I began this blog, with the concept that the involvement of post-menopausal women in childrearing has helped us to improve as a species? Well, score one for the Robinson-Obama clan. The last time there was a GOTUS was back in the Truman administration. “Mother Wallace” never approved of her son-in-law, who felt that her daughter had married down. But she lived with her daughter and son-in-law for 33 years. In the apartment they lived in before they moved to the White House, she shared a bedroom with Truman’s daughter Margaret. The Obama-Robinson set-up appears to be working. When the family leaves the White House, their new home will include an apartment for Grandma.